Even by the standards of social media fiascos, this one’s a doozy. On Monday, Burger King’s official Twitter feed announced the chain had been sold to its rival and began posting pro-McDonald’s messages and tales of employee drug use. It’s unclear who is behind the mischief but the tweets’ references to “lulz’ and “@youranonnews” suggest the hacker collective Anonymous is involved. haha! re: http://t.co/xnH76Sry : RT @cebsilver . @scottmonty "What was the account password?" SM Intern: "It was 'whopper.'" "You're Fired." It’s accepted as common wisdom for big brands to have an active presence on social media but this incident shows how things can go very wrong. Previous Twitter disasters involve McDonald’s buying a sponsored hashtag to promote “McDStories” only to see users tell tales of gross food and alleged animal cruelty. 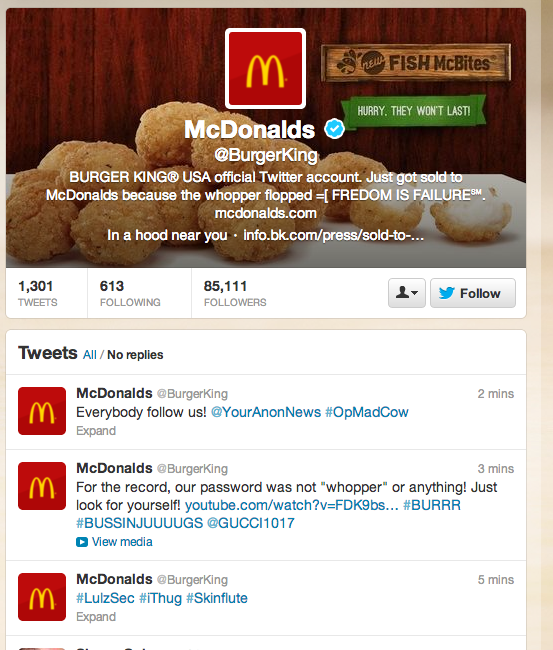 As of early Monday afternoon Eastern Time, the Burger King account was still under control of the hackers. With @BurgerKing getting hacked they got a 30% rase in followers, remember to unfollow. I wish just one of these news stories would give a better explanation than just “got hacked.” How did the perps get control of the account? Did they brute force, just a luck guess, got control of the e-mail account that is backstopped, get the password from a phishing attack? Come on Gigaom, do more than the other big news outlets. Social Media is future of internet. Hacking the twitter shows importance and impact of social media. What loser follows a fast food chain on Twitter? Orâ€¦ who cares about this non-story? Where do you start with this one? Looks like someone and their boss (and their boss) are looking for a job. I guess that’s what we call a “MacHack”…. Yeah, my first thought was that they probably hacked into their own account for the PR! Probably gives BK more exposure than they have had in a long time. Only social media insiders will see this as a ‘disaster’. All this talk has me thinking about a Whopper for the first time in a long time! Well said Frank. This is the latest example of a non-event that I’m using as a way of siphoning off the so-called social media experts who actually haven’t got a clue what they’re talking about.